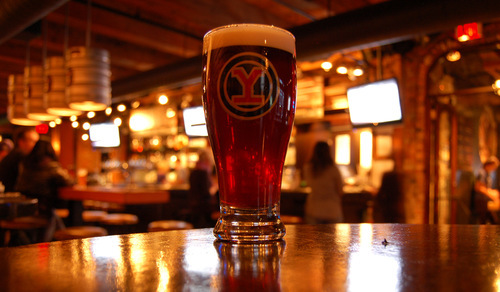 Despite its proximity, it had been a while since we’d stopped into the Yaletown Brewery for a beer, so while Mrs. Sip collected her steps for the day (damn you Fitbit! ), I suggested we make a trip out of our extended walk and see what they had on tap. We came in on the perfect day. All the restaurant’s beers, from mainstays to limited releases were only $4.50, a deal I believe they run every Sunday to go with their range of pizzas, which are also discounted. While Mrs. Sip ordered a beer that will be discussed here at a later date, I asked for a serving of their Golden Buddha IPA. I really enjoyed this beer and Mrs. Sip and I remarked at how this once apprehensive towards hoppy beers guy, now loves them. I’m not sure if it’s because the style grew on me, or my tastes evolved, but either way, I’m happy for the development. Given the high alcohol (8.3%) and decent IBU (65), it was a very smooth IPA. The bitter aftertaste wasn’t too much of a problem and the beer was easier to drink than I would expect. As we live within Yaletown’s borders, we’ll have to keep the nearby brewery in mind… especially when I’m forced to go on more “romantic” walks! This entry was posted in BC Beer Baron and tagged BC Craft Beer, Craft Beer, Golden Buddha IPA, Sunday Deals, Yaletown Brewery by Daniel Wilson. Bookmark the permalink.